Differentiated Technology and Superior Competitiveness! Hydrogen Water Generation Technology: KYK applies patented technology embedded with PEM and titanium platinum plates to generate high-quality hydrogen water, which is odourless, magnesium (Mg)-free and ozone-free, without requiring a water storage tank. 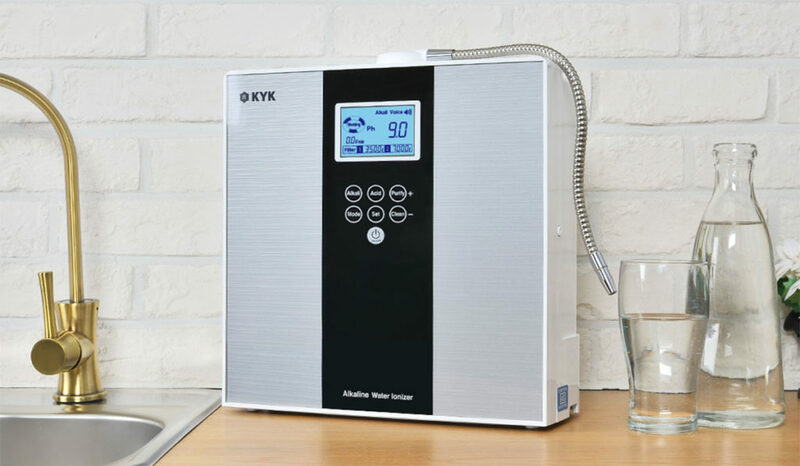 Compared to the general hydrogen water generators, which add Mg to increase the hydrogen content or contain a water tank to supply the electrolytic cell with a sufficient amount of water, KYK’s hydrogen water generators produce and dispense high-quality, Mg-free and ozone-free hydrogen water that has a high hydrogen content and tastes clean and pleasant, using the ion separation membrane and patented technology. Devices without an ion separation membrane inside the electrolytic cell produce water that has an ozone smell and is harmful for the body, and this is why it is filtered through activated carbon. Such devices have complex structures, and they produce low-quality water. There are also hydrogen water generators that do contain an ion separation membrane, but the outlet for ozone water is blocked completely, so these water come out by getting mixed in with the hydrogen water. KYK also offers products with 1, 2, 3, or 4 filters, as well as an embedded filter chip and control system to detect the amount of use, usage period, use of a similar filter, and reuse of a filter as a means to ensure safety and sanitation. Also, KYK Hydrogen water generators have zero wastage of water unlike the traditional old type alkaline water ionizers. 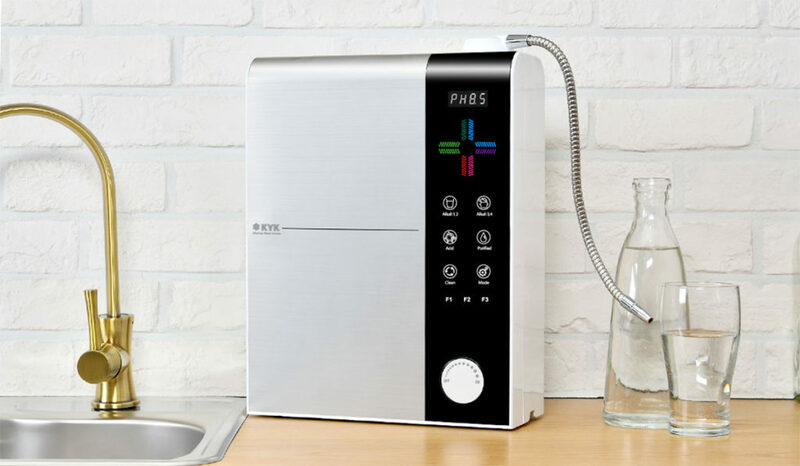 Alkaline Ionized Water Technology: ① Electrolytic cell: The electrolytic cells plays the most crucial role in a Alkaline water ionizer, and it is comparable to the engine of a car. With a patented electrolytic cell technology, KYK has differentiated the performance (water quality and taste, and product effectiveness, lifetime and functions, etc.) of its products, which boast superiority over its counterparts. ② (A) Ampere adjustment levels: The DC supplied to the electrolytic cell can be precisely controlled to 4,000 levels (4 pH levels x 1,000 levels = 4,000 levels). This is a special type of technology that helps address the issue of variability in the pH level resulting from changes in the amount of supplied water, and allows users to generate Alkaline ionized water in the exact pH level that they desire. ③ Clinical trial: A clinical trial has been completed at the prestigious Seoul National University Hospital in Bundang, Korea after obtaining approval from the Institutional Review Board (IRB), and the remarkable clinical result of “85.7%” astonished the investigators and medical staff. ④ Non-powered automatic channel switch valve: The non-powered automatic channel switch valve developed with KYK’s patented technology switches the channels without requiring any electrical power. This in turns saves electricity and boosts product performance and lifetime.